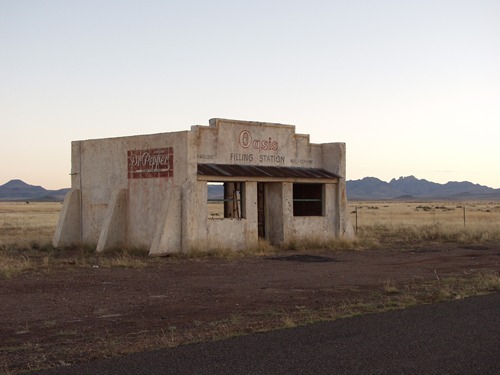 Charlotte Thurman, an alert reader from Midland, Texas immediately recognized what we do here at Texas Escapes and sent us some photos of a lonely building out in Jeff Davis County (in Jeff Davis County most of the buildings are lonely). 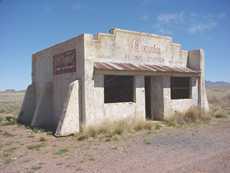 To us, the mysterious building first appeared to be a well-preserved temple of a lost West Texas culture. Holes in the front of the building may have once anchored signs that have since been looted and sold on the international black market. The painted sign shows that the lost culture had Dr. Pepper. They also had the manpower or ambition to construct unnecessary buttresses to hold up the pseudo-adobe/stucco walls. Ms. Thurman asked what we knew of the building, which we'll admit was just slightly less than nothing. So we did what we always do when we don't have an answer. We called an expert. We called Anne Cook, our media and film consultant in Austin and she said it was probably a set from Dancer, Texas, an independent film from a few years ago. We asked if she would use her influence to cut through the red tape and talk to one of her contacts at the Texas Film Commission, which for some reason, is a part of the Governor's Office. She soon emailed us back with a confirmation that it was indeed a genuine movie artifact from "Dancer". The film commission spokesperson added that there were no tanks or gasoline storage on the site. It had not occurred to us to ask that question, but we're always glad for any information we can pass on to our readers. "We put the SELF in Self-service"
We heard again from Charlotte Thurman, who followed up her original question about the Oasis Gas Station out near Valentine, Texas. She even included a photo of the movie's box cover and indeed - there at the bottom of the cover was the Oasis Gas Station - with red, white and blue pennants flying (perhaps from their grand opening). Judging by the cover, (something we've been warned about doing) - it seems to be a buddy-picture since there are four smiling young men pictured in a group shot. The film-maker wasn't taking any chances and stacked the deck with: one young man with glasses (a la Buddy Holly), one wearing a T-shirt (a la James Dean) and one who is the spit and image of a young Paul (as in Hud) Newman. The fourth appears to be a Bridges Brother we hadn't heard of. Well, it may be a Last Picture Show for a new generation, but we don't see anything wrong with that when you consider what's come out of Hollywood since the original Last Picture Show (that includes the sequel Texasville). The cover finally gave us the population of the fictitious Dancer, Texas to be 81. This is the same number that Round Top, Texas used to use. Round Top claimed to be "The Smallest Incorporated Town in Texas". Their year 2000 census figure was in the low 90s - maybe they still are. Our thanks to Charlotte Thurman of Midland, Texas for sending in the photos and for sharing her discovery with us, and for following up and solving the mystery of the Oasis. Charlotte receives a coupon for a free Oasis car wash and a guided tour of the Oasis Oil Company Refinery - propped-up somewhere between Lobo and Valentine. Our thanks to Anne Cook and spokespeople at the Texas Film Commission. Dallas area artist Norman James and Denise Gardner share this photo of Norman's painting of the Oasis - the gas station that never was - but nevertheless remains in the hearts of many people - especially former residents of Dancer, Texas. Visit their site www.njamesart.com and see how many special places accross Texas have been immortalized in oil. Dear Editor, I recently returned from a September trip to the Ft Davis area. I was really looking forward to taking photos of the Oasis Gas Station as a friend had taken some really cool pictures of it a couple of years ago. I drove out to the site and was disappointed to find it had either been torn down or destroyed. All that was left was a couple of small adobe pieces on the ground. I inquired with a few Ft Davis locals as to what had happened and they were not aware that the structure was gone. One person had driven by it as recently as back in the spring and said that even though it was crumbling it had still been standing. I enjoyed your website -- very informative. "... It's a lovely film, and well worthwhile for anyone with an appreciation for Texas small towns. The writer/director, Tim McCanlies, lives in Rosanky; his depiction of growing up in a teeny tiny town is right on the money. DANCER was filmed mostly in Fort Davis, which looks absolutely beautiful. I watched this movie with my parents, and nobody was embarrassed by anything in it -- that's a rare treat.